Rahul Dravid may have played 150 Tests in a career spanning 15 years, but admits he still feels the pressure to contribute to the team. The Tests in West Indies will be Dravid's first series since the trip to South Africa in December-January and he said it had been a challenge to maintain intensity during the down time. "I am relaxed, but there is always a pressure to go and score runs, irrespective of who you are," Dravid said after his first training session at Sabina Park. "You want to make a contribution, but you know that there is a lot [that] you have accomplished, a lot that you have already done, which cannot be taken away from you. So I do relax more with regard to that part of the game. "But when I go into a game, I am still nervous. That never changes, whether I am playing my first game or my 151st game. The reason that I continue playing is because I love the contest and love the vibes. I am still enjoying the game." Dravid is not part of India's limited-overs set up anymore and said that, while it was challenge to maintain focus during the gaps between Tests, he was well-prepared for the upcoming series. "It has been five-six months that we played a Test match," he said. "There has been a bit of IPL in between. It's a challenge to keep it going but the good thing from my point of view is that we have got seven Test matches in a row now (three in West Indies and four in England), once we start on June 20. "That was at the back of my mind as I was preparing for this series and England. It will be good to get some runs early on and hopefully carry the form in the seven games." Dravid averages 70 in the Caribbean, with 1260 runs from 14 Tests, and has scored two centuries and ten half-centuries. This is his fourth tour of the West Indies. He averages 55.60 with three half-centuries in three Tests at Sabina Park, the venue of the first match. The previous time he played here, Dravid top scored for India in both innings (81 and 68) of a low-scoring game to help them win the Test and the series. "I have very pleasant memories of the ground, especially after what we achieved here when we came here last time," Dravid said. "When we got here, anything could have happened on a low-scoring wicket, anything. We were the better team in the series, but on a difficult wicket like that you could so easily lose. I will definitely say that it was one of my better innings that I [have] played in terms of the quality." 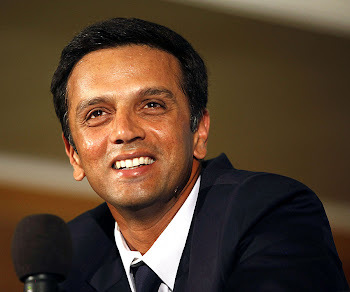 Dravid said it had been his childhood ambition to play in the West Indies. "After hearing so much about playing in the West Indies, as a young kid, [I was] looking forward to coming here. My ambition has never changed. "I grew up to my dad turning the radio on and hearing commentary about Gavaskar scoring hundreds here [against] the fast bowlers, and dreamed about playing here. You want to come here and play in front of passionate crowds. Even when you are walking on the street they seem to know so much about your scores. I know that the grounds are not that full for Test matches but I still hope that there will be a good atmosphere." There are quite a few young players in the Indian squad and Dravid said he is looking forward to passing on his experience and helping in the transition phase. "I am hoping that over the next seven Test matches, there will be opportunity to share those experiences, especially with some of the young batsmen coming up. "I know that in the next couple of years there will be times young batsmen will come through and that's the way it should be. They are getting a lot of exposure in the one-day game, Twenty20 and the IPL. A lot of them are more experienced [compared to] when I, Sourav Ganguly or VVS Laxman came into the team. Hopefully when they make it to the team they can have the long careers that we have had. You know that the team is going to be in good health if three or four [of these] guys can establish themselves and score runs consistently. So it will be interesting to see which of these guys can perform for India."